Recent efforts are tweaking the formula for massive open online courses and expanding their reach to new audiences. Harvard is experimenting with “small private online courses” exclusively for its alumni community. The MOOC philosophy has always come across as "Go big or go home." But some of the most interesting experiments occurring right now would better be described as "Divide and conquer." These undertakings — one an experiment at Harvard (MA) and the other a longer-term commitment at the University of Michigan — are allowing schools to try out new practices from a narrower perspective, while still impacting the broader workings of the institution. The population of non-U.S. students at the University of Michigan has increased every year over the last decade. The 2,619 students from China, Hong Kong and Macau make up 44 percent of the institution's international enrollment in the 2014-2015 academic year. Yet that's a pittance compared to the nearly 23,000 Chinese students who have registered for "Model of Thinking," one of U Michigan's first massive open online courses to be produced in Mandarin for the China market through its Coursera ties. Coursera's site features Chinese-language courses from four schools in China, including Peking University and Shanghai Jiao Tong U. But over the last couple of years the company has announced deals with three Chinese firms, NetEase, Hujiang and Guokr, to launch Chinese-language versions of its English-language courses. Dropout rates will probably stink in China too, but the data will be rich. DeVaney said that it's a "fair assumption" the university will see the same kind of low completion rates in the China MOOCs as it does in its English-language MOOCs. But even rock-bottom rates may not matter, he pointed out: "One of the issues with the completion rate as a metric is that we're finding that the students participating in MOOCs don't always intend to complete [them]. That's not their learning objective." MOOCs equate to research hotbeds for the schools that undertake them, and the China efforts should be no different. "There's lots of experimentation with different forms of video, with different interaction tools, with tools that live outside these classrooms, which may impact the overall level of engagement," DeVaney explained. "There are many different 'micro experiments' going on within each of these courses. What will emerge over the next two, three, four years is more compelling and comprehensive learning analytics data about these courses that will go deeper than just the completion statistic." Faculty can improve their instruction in the face of diversity.What's most profound for institutions participating in non-traditional MOOCs, said DeVaney, is what faculty learn from those teaching experiences that they can bring back and apply in residential learning environments. He cited the example of Margaret Wooldridge, a professor of mechanical engineering who teaches "Introduction to Thermodynamics: Transferring Energy from Here to There," a MOOC being offered three times this year on the NetEase China Web site. The course has already had a great deal of international exposure, DeVaney stressed, and Wooldridge has been able to "learn a great deal about which pedagogical approaches work best." Now, he added, "After having benefited from those very large sample sizes of students, she's able to take those lessons back home to Ann Arbor to teach her thermodynamics course here. You see that across a number of different MOOCs we're doing." One form of dividend being paid by MOOCs to on-campus classes takes the form of digital artifacts. Video modules and learning objects created for the MOOCs can be built into blended forms of classes and used in a flipped environment. At Harvard, MOOCs are targeting a population closer to home: the university's alumni. 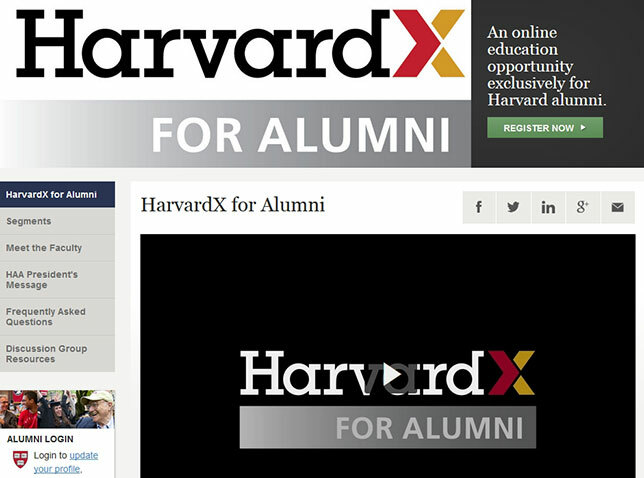 HAA, the Harvard Alumni Association, certainly isn't new to engaging online with its alumni. Its Web site includes tools for connecting with alumni and finding out about upcoming events. There are YouTube and iTunes channels for tapping into Harvard content. And several years ago the school offered "Justice," a series of online videos and forerunner to today's MOOCs. Developed for alumni and eventually shared with the rest of the world, "Justice" featured Michael Sandel, a well-known professor teaching what HAA Executive Director Philip Lovejoy refers to as "the most popular undergraduate course in the college." "That was our first foray into really intentional online learning for alumni," he said. The series was later turned into a PBS show. Surveys had shown HAA that alumni were particularly drawn to events featuring faculty members, current scholarship and research, and the chance to learn. After HarvardX began producing courses for edX, the association began to consider how it could use the MOOC platform to fulfill alumni desires, especially for those who no longer had "physical proximity" to campus. "We saw this as an opportunity to fill in those engagements digitally and get the content out there [in a format] that isn't dependent on time or location," observed Erin Mackey Kistler, senior associate director of college alumni engagement. Over the course of a little less than four months, HAA's "small private online course" (SPOC) experiment presented seven programs — a new one every two weeks — covering neuroscience, poetry, history, computer science and other topics. Each was a hybrid featuring materials created for HarvardX MOOCs and content such as faculty conversations created exclusively for the alumni program. As Mackey Kistler described it, the final product reflected "more dinner party than dissertation." Be prepared for a big response. Alumni from the ages of 22 to 96 seized onto the SPOC with wild enthusiasm — so much so that HAA's help desk answered 4,300-plus support calls, a tremendous increase over the usual number, reported Mackey Kistler. A big hurdle was the dual-registration process required for the program, one for the alumni association and the other for the edX platform. While HAA realized that single sign-on would be the optimal approach, it chose the speedy route to launch over waiting for the ideal login situation, which would have taken a significant amount of time to build, she explained. "We went into this with a bias toward action, to get in there and give it a try," she recalled. "That resulted in a lot of people here working very hard. The response in terms of staff stepping up to the plate was tremendous." Promote the experimental nature. Lovejoy said HAA warned SPOC participants that they were signing on for "an experiment." As such they could expect to be asked for input and feedback so that the association could learn what was and wasn't working and adjust the program on the fly. For example, additional content was quickly developed when people clamored for it in a pre-event survey. "Those kinds of iterative improvements were something that we were happy to be able to do and also something we learned a lot from," he remarked. E-mail still works. HAA saw the SPOC as a "huge opportunity" to test and understand more about e-mail communication. Throughout the course registrants received more than 35 e-mails, typically two or three — and even as many as four — in a week. Because the team had data about the alumni who had signed on for the program, that was used for "segmenting and targeting messages by age, stated interests in the different topics of the course, by a number of things," said Mackey Kistler. That's been hugely informative, she added. "When people opt into a program, they want to know about it and they want to be informed." In a survey at the end of the program "almost everyone said they received just the right amount of e-mail." Those e-mails helped drive up participation in the modules as they were being released. According to Lovejoy, the revamped communication strategy counteracted "a little bit of the MOOC dip," an outcome of interest to HarvardX in general as it ponders how to communicate with participants in its MOOCs. Getting clubs and SIGs involved perpetuates interest. Harvard's alumni clubs and special interest groups, all volunteer-run, provided ways for people interested in the SPOCs to connect locally in person. For example, even after a program had ended, HAA left the course open for an extended period. Some of the clubs took advantage. The Cape Cod club, for instance, convened an in-person discussion group in the summer after the course had ended, "because that's when they had critical mass and that's when it was best suited for them to get together to talk about it," recalled Mackey Kistler. Although HAA hasn't committed to a next step regarding MOOC use with alumni, Lovejoy suggested that one possible model may be to find "more consumable modules of rich content, because time and long-term commitment is a real challenge." Instead of 12 lectures over the course of a term, for instance, "maybe it's three lectures clustered into a coherent module," he said. The question of what's next always seems to chase the topic of MOOCs. What's new and of note "seems to be something where we're all interested," said Mackey Kistler. "We all want to learn how to use the tools available to us to the best advantage. I feel like we were an early entry." But in time, she added, "I certainly don't think we'll be standing here alone." The University of Wisconsin-Madison is in the process of testing short-form four-week MOOCs as part of its "phase two" offerings. The goal for these courses, which focus on environment and community, is to see whether the school can grow the overall 3.2 percent completion rate it saw in phase one. The courses will be hosted on Coursera. Harvey Mudd College (CA) will soon be releasing "Middle-Years Computer Science" (MyCS), a MOOC intended to show middle school teachers how to offer computer science to their students. The work is funded by an NSF grant and has been tested live in California and Hawaii school districts; a planned February 2015 launch has been shoved to later this year.